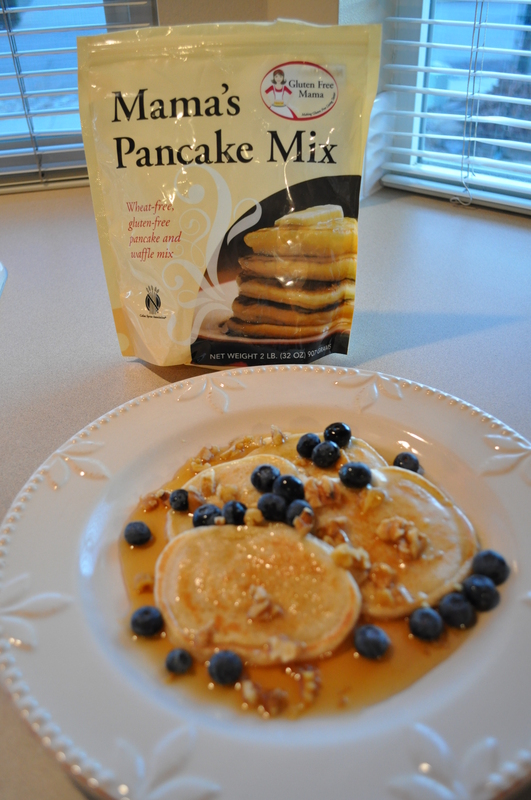 Mmm…pancakes slathered in butter (dairy free for me) and pure maple syrup, sprinkled with blueberries and walnuts. Definitely a delicious way to start the day. I’m still searching for the “perfect” dairy-free and gluten-free pancake mix, but so far, Mama’s Pancake Mix gets a thumbs up over all the others I’ve tried for flavor. I added vanilla to the batter this time for a little extra kick and it was quite nice. Probably my one complaint about all gluten-free and dairy-free pancake mixes is that they don’t get very fluffy and most of them are either too bread like or kind of slippery. Mama’s has a pretty good texture along with great flavor. I would recommend trying it, and then experiment to add your own flair. Next time I’m going to separate the eggs, beat the egg whites and fold them in. That might lend to a fluffier pancake.